We have just released ENVISION version 11.5. ENVISION® has been under constant development to help organisations gain greater business value from enterprise architecture initiatives whatever methodology is preferred. The powerful modelling tool is quickly configured for TOGAF, DODAF and others, and inter-operates with other applications in the ENVISION domain. It is easy for analysts to closely couple architecture models with resource, business process and business capability models, and strategic plans. • interoperability with third-party business process management tools – allowing departments the freedom to innovate using social media and to upload the result into the corporately controlled Envision environment: a valuable blend of flexibility and control. • improved algorithms that enhance matrix analyses. • an improved Win 10 user interface that is intuitive and reduces user training requirements. ENVISION empowers businesses to make informed decisions that accelerate continual improvement and enables organisations to cope profitably with rapidly shifting regulatory requirements and market demands. 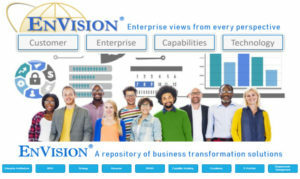 Envision is a single collaborative platform that empowers all disciplines within an organisation to coordinate managed business and IT transformation.